Lush rainforests, green mountains and sandy beaches dominate. Guess who I am? Costa Rica? Maui? All of the above, actually. 2018 started off right for me with travels to both Hawaii and Costa Rica. With so much noise and negative news in the world, sometimes you just need a break—a traveler’s recharge. Not surprisingly, the tourism industry continues to experience impressive growth. In a recent statement, the World Tourism Organization announced that international tourist arrivals grew by a remarkable 7% in 2017 to reach a total of 1,322 million. This strong momentum is expected to continue in 2018 at a rate of 4-5%. A quick google search shows that sustainable tourism is trending more too. Great news for business owners in the sustainable tourism industry. 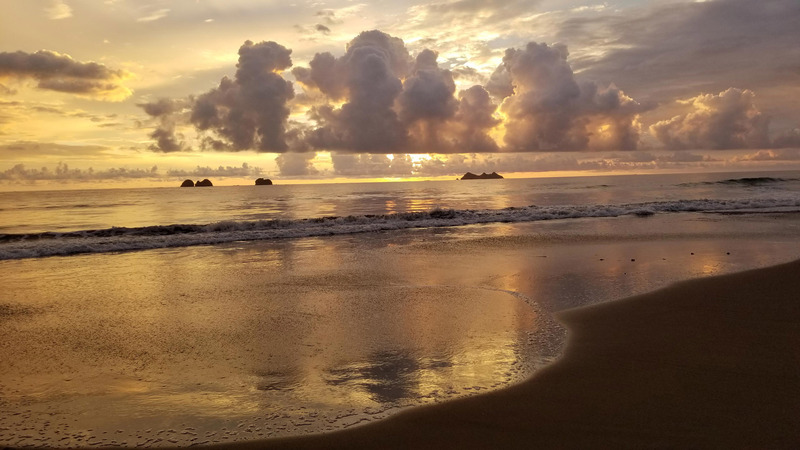 One of our favorite spots, Costa Rica, was recently named to the world’s top ten best ethical destinations. As mentioned in recent posts about the country, Costa Rica is always top of mind when it comes to sustainable tourism. In addition to tourism sector success, Costa Rica set a goal of achieving carbon neutrality by 2021 and had an impressive run of energy efficiency in 2017. As you plan your 2018 vacation schedule, consider a Costa Rican getaway. And now, I’ll leave you with a picturesque CR sunset. As always, travel light, travel right.